“How does Printmaps.net work?” – and other frequently asked questions. Don’t see an answer to your question? Get in touch! Can I get a sample map? How can I change the map design? How can I control font sizes? Can I add a route to the map? Can I display a list of POIs on the map? Can I highlight a country, city or region on the map? Can I upload other data onto the map? Can I add multiple routes or shapes to one list? Can I combine different types of overlay content? I designed a map and want to use the design for a similar map later. Is that possible? I need a map bigger than 33x33 centimeters, what can I do? Do I need 300 dpi or 600 dpi for my print project? What fonts are used in the maps? Can I use custom markers or logos? Something is wrong in your maps. What can I do? How often do you update the map data? I need vector maps for my project. What can I do? What map projection do you use? How much does a map cost? How long do I have to wait for a map? Can I buy multiple maps at once? Are there volume discounts if I need many maps? How often am I allowed to print a map? May I adapt or change the map? How do I have to credit/attribute the map? Can I transfer usage rights to a customer of mine? May I use a map I paid on my website? Can I integrate the Printmaps.net editor into my application? I want to link to Printmaps.net. Do you offer revenue share? Do you have special offers for publishers or bulk users? How come you have so many high profile customers if you only started in 2017? OpenStreetMap is freely available. Why isn’t Printmaps.net free? You will get your map in both a high-resolution PNG format and a layered Photoshop file (PSD). With the layered Photoshop file, you will be able, even after having created your map, to alter and modify your map as much as you want. Give it a try by creating your first map here. The preview tab will show you a preview version of your map in 72dpi resolution. It will include all the edits, routes, POIs, etc. you may have included, and can be used for preview or as a placeholder for your design project. It’s a great way to see whether it has all the things you need in your printable map before you add it to your shopping cart. On the Design tab you have all the options you need to design your map. 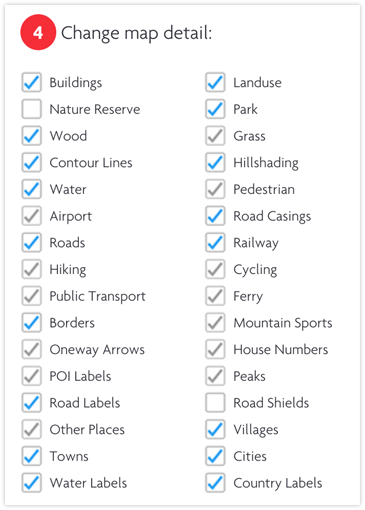 Add or remove features by simply checking or unchecking the respective boxes and switch between the various map-styles we provide. And don’t worry about adding to many features: one of the file formats you’ll receive will be a layered PSD file. Open it up in Photoshop and you can still remove whatever features you’ve changed your mind about. Why not check it out directly in our editor? There are two ways for you to control the font size: You can either use our scaling slider, which will keep your map’s site and selection, but scale label sizes up and down. If you want to scale even more, the other option is using Photoshop to edit the layers for the labels you want to change. See here what font and Photoshop font settings to use. Absolutely! 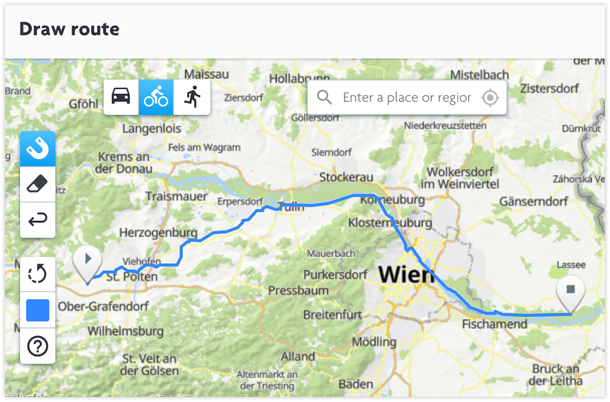 You can add routes eiter by using our automated drawing tool or by uploading routes as KML or GPX files. This is especially helpful if you’ve already got hiking or bike routes you want displayed on a printable map. Just upload them to our editor and we’ll do the rest. And even if you don’t have your routes in a file already, our smart magnet tool makes sure your routes are adapted to whatever mode of transportation you choose. You can add your own POIs to your map. Just use the “Add POIs” button and enter the required geo-information to pinpoint your POI. If you’ve got a list of POIs you want to import, we offer tools for you to easily get that done as well. And if that hasn’t convinced you yet, you’ll be able to choose from an array of various icons to represent your POIs, in addition to choosing whatever color you like. You can! 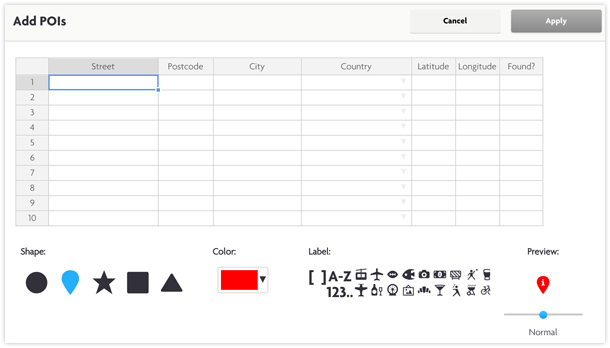 Use the “Add Shape” button to query for the shapes we’ve got in our database. You can either highlight these areas or invert them to create a map focusing only on the shape you’ve selected. Adding multiple shapes is supported as well, and since we’re all about flexibility, you can choose whatever colour you like for your shapes (or the shading if you’ve inverted it). If that sounds too good to be true, just go ahead and try our editor, because, really, it’s all true! Oh yes, you can! Add shapes, files, POIs until your map is filled to the brim. Our editor is flexible and quite forgiving, so if you change your mind about something, we’ve got a handy “Undo” button that’ll help you out in that case. As with all things visual, just make sure you don’t overdo it, because simplicity is key, right? Yes! 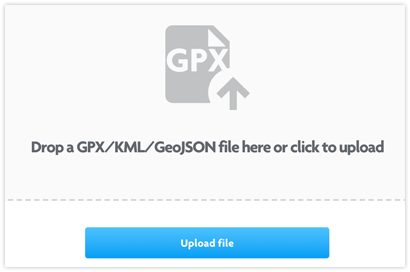 With every map purchase you will get a permalink (along with the download files) that you can use later to open up the Printmaps editor with all settings and data of your map. This way you can create a new map based on a previous one. Printmaps is currently limited (for technical reasons) to maps of max 330mm (or 33cm) side length. If you need a bigger map you can create two adjacent maps (make sure to keep a little overlap) with identical settings (zoom level, scale percentage, rotate degrees, map style, etc). Generally 300dpi works well for almost all print products. 600dpi is only necessary for large scale print products. We are using the following fonts in our maps: Noto Sans, bold and regular and Sorts Mill Goudy Italic. They are licensed under the Open Font License, so there are no restrictions on their usage. Install these fonts, open up Photoshop and add your own labels to the map! The font settings in Photoshop of most labels are: Size 40px, Tracking (distance between characters) 75, Anti-aliasing: Crisp. And font effects: Stroke 4px white, Opacity 80%. No and yes. When you add your POIs to your map, you have the option of choosing between a number of various icons that should might suit all your marker needs. If you happen to have custom markers, say tailored to your publication, you can change these markers in the respective layer once you’ve received our layered PSD file. Check out our editor to see all the markers we offer here. We source our cartography via Openstreetmap. If you are sure that data is incorrect, you can edit the relevant area in openstreetmap yourself. Have a look at this handy guide, which will walk you through your first Openstreetmap edit. If you happen to already know how to edit Openstreetmap, well, then edit away! If you’re absolutely confident that the error in our maps is unrelated to Openstreetmaps, drop us an e-mail at help@printmaps.net and we will look into it. We regenerate our cartography with new data about every two months. 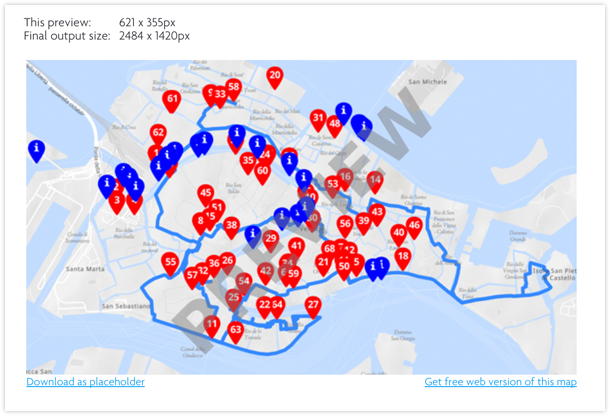 We do not yet support vector maps (SVG or AI), but are actively working on a solution. Printmaps.net uses the WGS84 spatial reference system with the EPSG Code 3857, as it is also used by Google Maps. It does! We provide cartography coverage worldwide in all zoom levels, including hillshading. Also geocoding and geographic shapes work in almost all countries. Delivery is by email, payment by major creditcards. Our pricing depends on the circulation of your map product. Our plans start at 15€/map for a circulation of up to 1000, and we do include a plan for unlimited circulation as well. Please refer to our Pricing page for all the details. If you just want to test what a printable map for your product would look like, why not choose our smallest plan? If you’re happy with the result, come back later to create a map for larger circulation. You can pay with the following credit cards: Visa, Mastercard, American Express (Amex). Once you’ve placed your order, it will be sent to our printserver, which will then generate your map. Please allow for up to ten minutes, depending on the complexity of your map, for our server to finish generating your map. You will then receive a mail with a download link to your map. If you want to create more maps while you wait, not a problem. Just go back to configuring you map selection and create a new one while you wait. Of course you will! Right after you’ve placed your order, you will receive an e-mail containing a proper invoice, including VAT and whatever else a proper invoice should contain. According to EU-law, we are obligated to charge VAT depending on your country of residence, but our pricing already includes VAT. If you supply a valid European VAT number for your business (except for businesses located in Germany), we won’t charge you VAT. You absolutely can, just create a new map and add it to your shopping cart. If you need a high volume of maps, we are happy to talk to you and see whether we can work out something beneficial to both parties. Drop us a note at help@printmaps.net. You are allowed to print your map in one product up to the number of circulation of your plan. If you happen to have chosen the “Unlimited” plan then, well, you can print your maps as often as you want. You can make any adaptations and modifications you want. This is especially easy with the layered PSD file you will receive, as you can modify those as much as you want. Not happy including things like street casing after all? Just remove the layer and you’re all set. You will have to add the image credit © Printmaps.net / OSM Contributors on the same page of each map. You sure can, as long as it doesn’t exceed 72dpi and contains the correct attribution: “© Printmaps.net / OSM Contributors” (Links pointing to www.printmaps.net andwww.openstreetmap.org/copyright). You’ll also find the attribution guidelines in our Terms of Service. We do offer white-label integration. Please send us an message to help@printmaps.net. We do run an affiliate program. Drop us a line at help@printmaps.net for inquiries and details. We can offer payment plans per year or per publication (disregarding the number of maps), depending on your use case. Please get in touch via help@printmaps.net. Printmaps.net is developed by Toursprung, a company focusing on digital cartography and geodata hosting since 2008. During these almost ten years of our existence, we managed to build up this portfolio of satisfied customers. While OpenStreetMap is free, the data we use is just one part of what makes up Printmaps. We have spent many hours building our own printserver, geo-hosting server, enhancement tools like our route editor, etc. We have spent a lot of time honing our map-editor so it’s both easy to use and versatile enough to provide everything you would need in a printable map. Why not try it out and see for yourself?